3Dokuz Eylül Üniversitesi, Hemşirelik Fakültesi, Halk Sağlığı Hemşireliği Anabilim Dalı, İzmir, Türkiye Objective: The study was performed with the aim of examining the relationship between nursing students burnout levels and professional values. 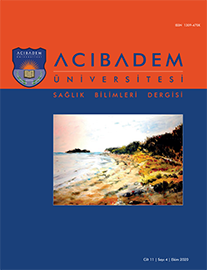 Study Design: This cross-sectional and descriptive study was conducted with the undergraduate students of a nursing faculty in Izmir (n=469) between April 2017 and June 2017. The study data were collected using the Socio-Demographic Characteristics Questionnaire, Maslach Burnout Inventory - Student Survey and Nurses Professional Values Scale - Revised. The data were assessed using the descriptive statistics, the test for the significance of the difference between the two-independent means, one-way variance and correlation analysis. Results: The mean burnout score of the second-grade students (16.02±4.62) was higher than that of the students in the other grades (p<0.05). While the mean burnout and depersonalization scores of the students who did not choose the profession of their own free will, who were not pleased with studying in the nursing department, who were not members of nursing student association, who did not have training on professional values, and/or who did not participate in social activities were higher, their mean competence and professional values scores were lower (p<0.05). While the correlation between the students professional values scores and their burnout and depersonalization scores was negative (p=0.308), the correlation between their professional values scores and competence scores was positive (p=0.00).